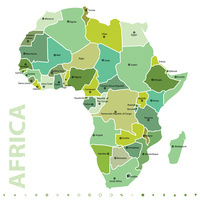 Over the past few years, a number of African economies have grown considerably – and continue to grow. In 2014, Africa’s population stood at a little over 1 billion people with a total GDP of USD2.5 trillion. In 2013, African exports to the world reached nearly USD600 billion, while imports totalled USD605 billion . The Ministry 1 of Industry, Trade and SMEs (MITS) has recently issued a comprehensive study of Egypt’s trade relations with Africa. It examines trade developments with various economic blocs and trading partners during 2010 – 2015. This report provides a summary to the study’s key findings, as well as an analysis of the current state of Egyptian - African trade and investment relations. This report outlines Egypt’s trade relations with Africa. The GoE has shown persistent actions to support and enhance economic, political and cultural integration in the continent. This has been demonstrated through a series of bilateral and multilateral free trade agreements, technical and industrial support, as well as hosting the RIA to promote investment opportunities in the COMESA. In June 2015, the Tripartite Free Trade Agreement was signed at a high-level conference in Sharm el Sheikh, symbolising Egypt’s effective return to the African community after its membership was suspended from the African Union in 2013. In November 2015, a regional trade and investment conference will also be hosted in Sharm el Sheikh to boost Egyptian-African economic ties.